Simply elegant floral rustic bouquet design in hand painted watercolor (watercolour) green greenery, blush pink, beige, champagne, vanilla, peach, white flower roses / peony on white background and black letters. 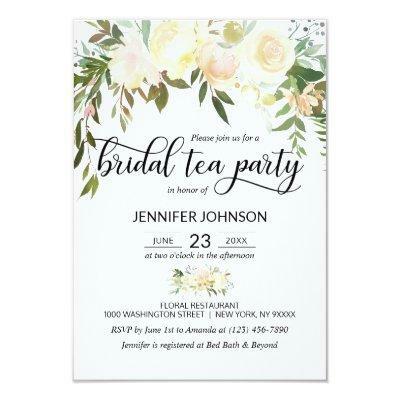 Delicate wedding bridal shower / bridal tea party invitations for that spring or summer theme. Perfect outdoor cards. Back of card has future .